Together with an experienced Engineer, the studio gear consistently delivers noiseless and crystal clear recordings. When it comes to the mix-down of projects, many years experience engineering Films and Albums makes much lighter & efficient work of the whole post production process. We use the finest German made Microphones (as favored by the BBC)). 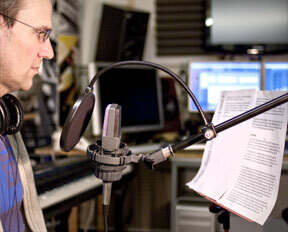 A great Mic makes a huge difference to productions of both spoken word and vocal recording. The Mic and signal chain it is linked to (a very special little box), has been specifically tailored to record every nuance of the natural voice. As well as sounding very professional, it enables the voice over recording to cut through the mix - giving your production the cutting edge clarity required for all levels of broadcast media. Our voice recordings are specifically tailored to suit each individual voice.